I had a wonderful couple of days with two different sewing events. The weekend started off with a class at the Fox Valley Sewing Expo with three very good friends sharing the ride up to Oshkosh and the events there. This is the sampler that we made. 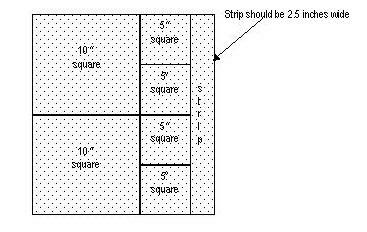 We were taught how to do all of the designs in the different boxes, at least 11 different motifs. My driving is still a little wonky, but the stitch length is getting so much better. That just excites me so much! Fox Valley's Sewing Expo is held every March and is the best kept secret for quilt classes. The prices are EXTREMELY reasonable and they feed you so well to boot. The teachers are top notch too, many of whom have written books and are national teachers. 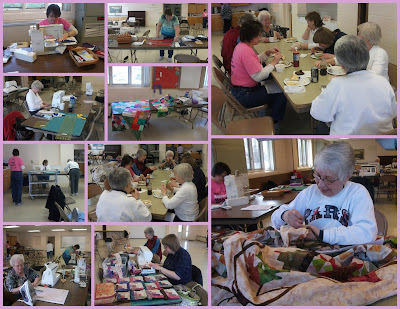 On Saturday our guild had a sew day for National Quilting Day in Reedsburg. They rented a wonderful facility so that all of us could sew at the same time and catered in a wonderful meal for us. It was a great day of fellowship, laughs, inspiration, and sewing. It doesn't get much better than that. Here are a few pictures from that day. Well, now it is time to get my sewing room cleaned up so that I can use it again. It gets so messy every now and again. I have too many projects going at the same time, but I can't seem to help myself in that department. Maybe next year I'll have to attend the Fox Valley Expo on Saturday. I'd love to go Friday, but being a teacher makes it hard. We need to schedule another guild sewing day! It was wonderful! You need to sign up for a retreat at Sugar Creek Bible camp.